Billy Nankouma Konaté, born in 1977 in Conakry/Guinea, son of great djembeföla Famodou Konate, began playing the traditional Malinke music at the age of 7. All he was wishing for was to become a great, well-known djembeföla; all his love was dedicated to music. He followed his dream and was educated by his father for years on the traditional „fêtes“ Malinkes. From 1987 on, he was going two years to the village Sangbarala, where he went with his mother. Here he was learning a lot about the culture and certainly the music of his people. Then he went back to Conakry where he continued his education with his father on the traditional „fêtes“. In the 1991 film Djembé-Föla by Mamady Keita, he was playing when Mamady and Famoudou met. In 1993, he created the ballet Hamana Sabougnouma under his leadership. It was a traditional ballet to the members of which Billy was also providing dance and percussion lessons and was doing tours in the different regions of Guinea. Having been to Europe for the first time in 1996, he would come back every year to teach people attending his workshops and to give concerts in Germany, France, Switzerland, the Netherlands, Italy etc. From 2002 thru 2004, he lived with his family in Marburg, Germany, where he still works as a teacher at LaPercussion, part of the TamTamMandingue association. Since then, he lives in Dudenhofen near Speyer where he continues to give master classes, lessons and workshops. In the wintertime, Billy offers his workshops in Guinea and visits his village of Sangbarala. In 2004, he finished building his own percussion school KONATEKOUNDA in Yembeya, ,a suburb of Conakry, where his current and future workshops will take place. 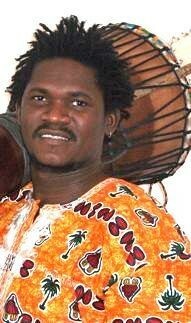 In 2002, Billy was playing djembé and doundouns for his father Famoudou when they did a tour across Europe with the ensemble Hamana Föli Kan. Same in 2004, when he joined Famoudou and his ensemble again for another tour across Europe and Japan. Billy was involved in all of his father's CDs and in 2003, he released his first own CD Saboule Möyala N´Wölobalou Kobarika. In mayi 2004, he released his second CD, M´Badakan, 2006 followed the 3. CD: Iniké Papa. 2008, Uschi Billmeier produced the CD Siyra Manden Mansa. The benefit of this CD will be taken to finance his project in Guinea: a school where the children learn traditionel music from Guinea without paying for it. When Billy is not in guinea, he finances another teacher to educate the young musicians. The works they do keep the traditions alive as well as give these Guinean children a great education. I am very impressed that he has been continuing this for many years now. In 2008, he joined some Germans and the started another project to help the Guineen children: they collect money to build a new rooms in the School of Sangbarala and to finance the teachers there. "All children should be able to go to school without paying, so they can have a better future." Billy Nankouma Konaté is one of the most remarkable African percussionists of his generation. He knows how to bring home Malinke culture to people professionally while personally touching each student with the deepest of tradition. Quite a remarkable, yet centered gentleman and a gifted teacher.